What is the MRF Symposium? 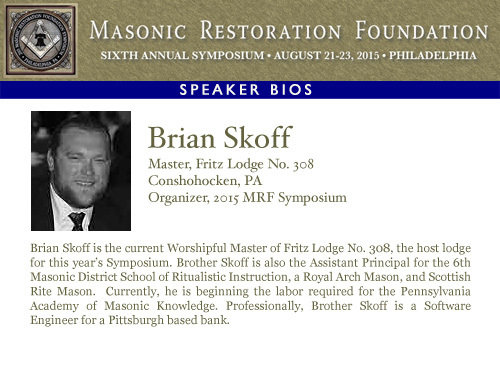 The MRF Symposium is a meeting place for Masons who are seeking the highest form of Masonic experience they can attain within their lodges, while strictly conforming to the laws, resolutions, and edicts of their respective grand lodges. It is a gathering for those who pursue quality in the Craft to share ideas and discuss their work. The Symposium begins on Friday evening at 7 PM, with a Festive Board in the Grand Banquet Hall, and concludes at noon on Sunday. We are fortunate to have an excellent program of speakers and presenters this year. 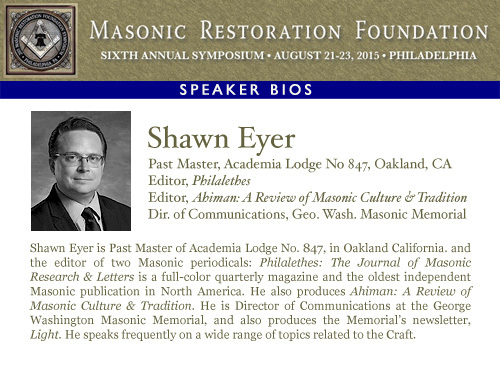 Any Mason in good standing may register for the Symposium, provided he is a member of a Grand Lodge which is a member of, or is recognized by any of the Grand Lodges which are members of, the Conference of Grand Masters of North America. Registration for the Symposium is $110.00. - Can We Transform a Brotherhood of Change? 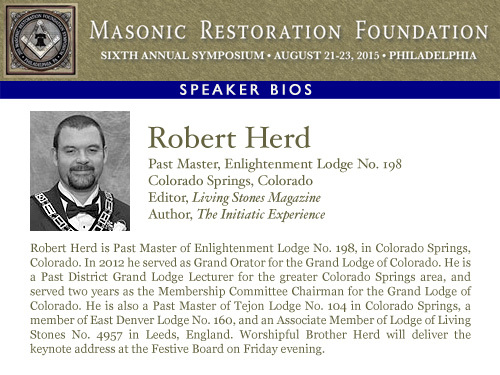 Robert Herd is Past Master of Enlightenment Lodge No. 198, in Colorado Springs, Colorado. 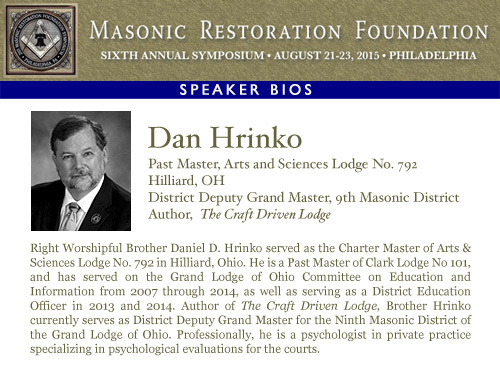 In 2012 he served as Grand Orator for the Grand Lodge of Colorado. He is a Past District Grand Lodge Lecturer for the greater Colorado Springs area, and served two years as the Membership Committee Chairman for the Grand Lodge of Colorado. He is also a Past Master of Tejon Lodge No. 104 in Colorado Springs, a member of East Denver Lodge No. 160, and an Associate Member of Lodge of Living Stones No. 4957 in Leeds, England. Author of The Initiatic Experience, Worshipful Brother Herd will deliver the keynote address at the Festive Board on Friday evening. 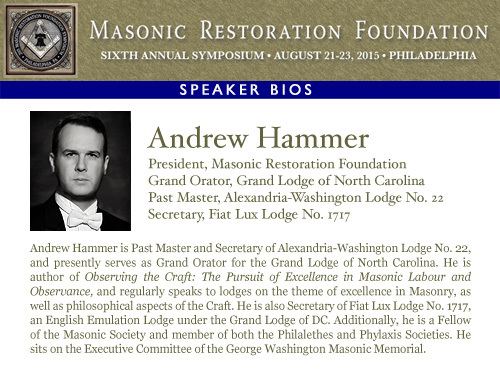 Andrew Hammer is Secretary and Past Master of Alexandria-Washington Lodge No. 22, Secretary of Fiat Lux Lodge No. 1717, and the author of Observing the Craft. 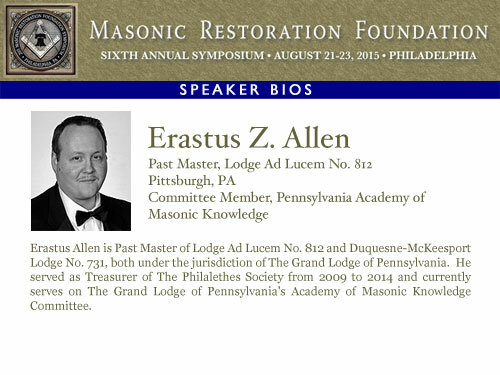 He presently serves as Grand Orator of the Grand Lodge of North Carolina, and is a member of the Executive Committee of the George Washington Masonic Memorial, a Fellow of the Masonic Society, and a Member of the Philalethes Society. Brother Hammer speaks to lodges throughout the United States and abroad on observant Masonry, as well as philosophical aspects of the Craft. 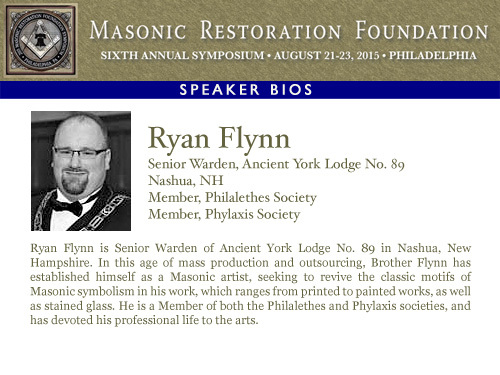 As President of the Masonic Restoration Foundation, he will address the Symposium before lunch on Saturday morning. 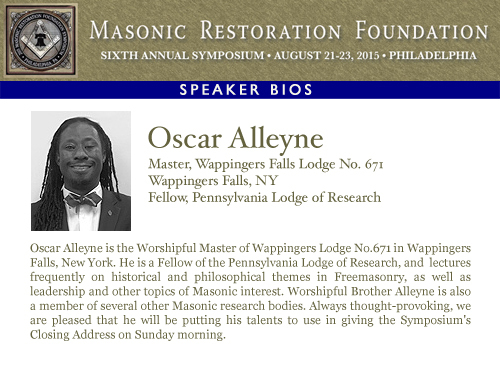 Oscar Alleyne is the Worshipful Master of Wappingers Lodge No.671 in Wappingers Falls, New York. 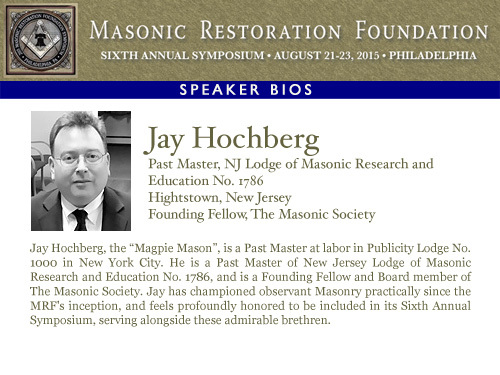 He is a Fellow of the Pennsylvania Lodge of Research and lectures frequently on historical, philosophical, leadership and other topics of Masonic interest. He is also a member of several other Masonic research bodies. He will give the Symposium's Closing Address on Sunday morning.